The Indiana State Legislative Board Chairman wrote an urgent plea last week that all train crews should be kept to two and not reduced to one, as the state government is considering, under pressure from railroad interests. There are more than 4,000 miles of track in Indiana, Brian Farkas wrote, and he argues in the article that an excellent safety record in the state could be jeopardized if railroad carriers reduce crew sizes to save money. The possible action stems from the Railroad Safety Improvement Act that Congress passed in 2008. It featured provisions to require positive train control technology on all railroads. This new technology, while a vast safety improvement, was not designed to effectively replace a crew member. Rather, it is designed to reduce train crashes. Farkas wrote that he thinks it would be a dangerous error if the state legislature agreed to reduce train crew sizes. A member of the state legislature in Indiana recently introduced a new bill that would require all freight train crews to consist of at least two engineers. Naturally, the bill is strongly opposed by railroad industry lobbying groups. The chairman urged Indiana readers to call their state representatives to voice their support for the train safety bill. We certainly hope that the state legislature in Indiana does not decide to allow railroads to reduce their freight train crews. Every train crew should have at least two members to ensure that the train is being operated safely. 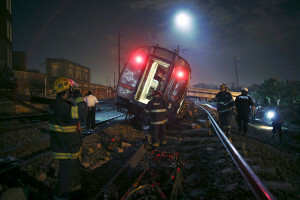 The news media has been filled with recent stories of serious train accidents and derailments that led to loss of life. A train collision with another train in 2008 led to several deaths, and all was because the lone train operator was on her cell phone. Our Virginia personal injury law firm works often on railroad accident cases, such as this $190,000 settlement. Anything that can be done to reduce the chances of train accidents sounds good to us. The number of pedestrian rail fatalities in Washington state climbed to 27 in 2015, rail officials stated this week, which has prompted a new safety campaign to warn people about the dangers of railroad tracks and crossings. The new goal for 2016 in the state is zero railroad fatalities. Nationwide, Washington is ranked #9 in train fatalities from Jan-Sept 2015, which is the most recent data available from the Federal Railroad Administration. California was tops on the list with 119 deaths, and Texas was second at 50 deaths. Fatality risks tend to climb due to the number of trespassers on tracks, improving train technology that makes locomotives quieter than ever, and also based upon the number of trains running per day in a given area. According to the state’s Utilities and Transportation Commission railroad safety supervisor, the major problem is with trespassing. “People don’t grasp that it takes a mile for a full sized freight train to come to a stop,’ he told the press this week. Bad weather can make it harder for pedestrians to see or hear trains approaching as well. And there was more warm weather in the state last summer, which may have led to more people walking near railroad tracks. In addition to the 27 pedestrian deaths, there also were two drivers who died when their vehicles were struck by trains at railroad crossings. There also were 104 non-fatal incidents on railroad tracks in Washington state in 2015, which led to cuts and bruises, and amputations in the worst cases. Most of the accidents and deaths that occurred were on BNSF owned railroad tracks, which owns over 50% of the railroad lines in the state. Because of the high number of deaths and injuries, the state chapter of Operation Livesaver is going to increase its number of safety presentations at schools and produce more radio and TV ads to warn of the dangers of walking near railroad tracks. As personal injury lawyers in train-pedestrian accidents, we often see railroads and the government claim that these types of tragedies are ‘trespassing accidents.’ The public may not be aware, but it is the responsibility of the railroads to maintain railroad tracks and keep them safe. Fencing off railways and trestles in areas with high foot traffic is vital to keep people from walking on train tracks. If you have a loved one who died walking on train tracks, know that the railroad does have responsibilities to keep high traffic rail lines safe. The railroad track is actually private property, and most railroads do little to mitigate these risks. Talk to a personal injury lawyer to learn about the responsibilities of railroads in maintaining their property safely. A nineteen year old died last week in Kuna, Idaho, when a train slammed into his car at a railroad crossing at more than 50 MPH. The local police stated that Peter Francois was struck by the train at a crossing in Kuna ID at a crossing on Black Cat Road. They also stated that the Union Pacific train was going 55 MPH when the wreck happened. It is unclear why the man did not stop the car at the railroad tracks. The police stated that there is a stop sign at the crossing. There is no crossing arms or flashing lights at the location, however. Police said that it appeared that the train engineer did follow the mandated protocol of blasting its horn before the crossing. While the number of train crossing accidents have fallen greatly in the last 30 years, most that still occur are in rural areas. Rural crossings are not usually required to have crossing arms and flashing lights. Unfortunately, railroad crossing accidents still are quite common, even though there are far fewer these days than decades ago. Our railroad accident attorneys in Virginia and North Carolina know that the majority of these accidents do not happen because the car driver is trying to beat the train. At passive rail crossings that have no flashing lights or gates, drivers have to watch carefully for train traffic. However, we have found that in many cases, drivers do not have a clear view to the left and right at the crossing. One of our clients was going over railroad tracks in Virginia when a train suddenly appeared and slammed his car into a ditch, which led to a sizable settlement. There have been studies of train crashes at railroad crossings, and it was found that sight obstruction from 2001 to 2005 had led to 87 deaths at the crossings. States have been quite slow to inspect railroad crossings and to remove all obstructions. If they did so, perhaps there would be fewer of these senseless tragedies. Anyone who has had a loved one killed at a train crossing should consult with an experienced attorney, because there are cases where the accident was not the driver’s fault. A new study of federal rail records has found that most train accidents are due to track problems and human error, according to The Columbus Dispatch. Some of those accidents and derailments have involved oil trains, but rather than focus on rail improvements and engineer training, US regulators continue to focus on beefing up tanker cars instead. After several dozen crashes, derailments and oil spills in the last few years, rail authorities in Washington DC have enacted new regulations that will make oil tanker cars more robust. While this is seen as a good thing by many, the oil tanker cars themselves do not cause most of the accidents. According to the former director of the U.S. Department of Transportation’s Pipeline and Hazardous Materials Safety Administration Brigham McCown, the first responsibility of the government and rail companies should be to prevent the accident in the first place. 1/3 of train crashes in the last 20 years were at least partly due to track problems, including splits in the rail or a bad joint. About 1/3 of the crashes were due to human error. These errors include an engineer nodding off as the train flies past a stop signal, or a worker not setting a brake properly. Most of the other accidents reported to the Federal Railroad Administration were due to mechanical, electrical and signal issues. The study stressed that as more trains are moving more oil by tanker car across the US, there should be a greater emphasis on improving train worker training, as well as beefing up rail line inspections by the Federal Railroad Administration. Railroads say that they are investing in better rail inspection technology, and also are purchasing better detectors that are installed along tracks. While our rail accident attorneys based in Virginia appreciate the federal government’s efforts to improve oil tanker cars, it should be demanding that railroad companies enact tougher rail inspections. It also should pass new regulations that toughen training standards for all train engineers. Railroads will always try to minimize their costs in any way possible, either on rail safety or in pay outs to victims in personal injury lawsuits. They always need to be closely regulated to ensure safety of the public. We once had a $60 million verdict involving a Norfolk Southern train that derailed and smashed into a gas station, which led to severe and permanent injuries for our client. After a year of denying responsibility, the railroad finally admitted its culpability in the tragedy. It took a lot of work on our part to get that verdict, but that is sometimes what it takes to get railroads to admit their role in derailments. Hopefully, tougher regulations on rail safety and engineer training in the future will reduce the likelihood of these types of accidents. A Philadelphia law firm stated this week that it will seek punitive damages in lawsuits filed for six more passengers in the deadly Amtrak derailment last May. The law firm, Baum, Hedlund, Aristei & Goldman, stated that the complaints that were filed in federal court will be consolidated with others that were filed earlier this year. The law suits allege that the accident could have been avoided if better safety precautions had been implemented by Amtrak. Eight people died and 200 were hurt in the May 12 derailment. The train entered a curve at double the 50 MPH speed limit. Last week, Amtrak announced that it had activated a new safety system on that part of the track. The system is called positive train control or PTC. It is a complex package of equipment and communications upgrades that monitor and control speeds of trains and locations to prevent collisions and derailments. Anyone who has suffered an injury in a train derailment will have a lot of questions about how to proceed in the legal sphere. 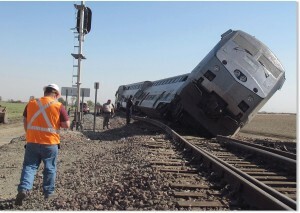 Our team of railroad accident lawyers has handled many train derailment personal injury cases in the last 30 years. One of our lawyers wrote a leading treatise on railroad health and safety that sits in most major law libraries. We also reached a $190,000 settlement in a case where our client was an employee in train transportation service, and the train derailed. Parts of his body hit the train, and he started to have headaches and tingling in his right arm after the accident. The case was tough to settle but with our tenacity and experience, we were successful. We have written two excellent legal guides on railroad worker injury law that could be useful to you if you have a loved one who has been injured in a train accident. You can download these helpful railroad injury guides here. The Nebraska Supreme Court ruled this week that a wrongful death lawsuit should proceed in the case of a 13 year-old Schuyler NE boy who was killed by a passing train in 2005. The 3-2 decision overruled the decision made by Colfax County District Judge Mary Gilbride; she dismissed the lawsuit in favor of Union Pacific Railroad. The case involves the death of Efrain Ramos-Domingo, who died on July 27, 2005. He was struck by a Union Pacific train as he and some friends rode their bikes over double tracks in Schuyler. The boy waited for the eastbound train to pass before he rode into the path of the westbound train on the next set of tracks. The wrongful death lawsuit alleges that the railroad was negligent because the noise of the first train at the crossing prevented the boy from hearing the next train. Evidence in court showed that the westbound train that killed the boy was going 59 MPH, and hit the boy 7 seconds after the eastbound train had passed. This meant that the boy’s view of the second train was obstructed until three seconds before he was hit. Evidence on the train’s black box recorder also showed that the horn on the train stopped sounding at least two seconds before the train entered the crossing area. Federal and company rules mandate that the train’s horn must sound for at least 15 seconds before entering the crossing and should continue as the engine passes through the crossing. The Supreme Court found strong evidence that the railroad did not operate the crossing safely. One of the judges wrote that Union Pacific had a duty to sound the horn as the train approached the crossing. The failure to do so was strong evidence that Union Pacific was negligent, Judge John wrote. We are very sorry to read about the needless death of this young man, but as Virginia railroad accident attorneys, we know how common railroad crossing accidents are. In many cases, injuries and deaths at these intersections could be prevented if the railroads were more diligent in honoring their obligations to the public. For example, one of our partners once took a deposition from several railroad workers in a case where a man driving a truck was killed at a train crossing. 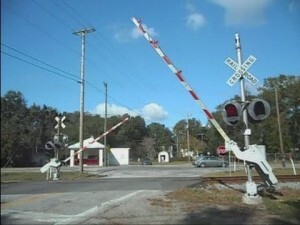 Our investigation showed that there were no stop signs or railroad cross bucks at this crossing. Also, the railroad employees stated that they did not know that they had a legal obligation to blow their train’s whistle at the crossing. How is it possible that a full time train engineer did not know this? Previous VA court decisions established that the railroad must sound its whistle at any railroad crossing, public or private. Yet the employees had no idea that they had this vital duty. This shows that sometimes railroad workers are not properly trained to safeguard the public, and this can lead to deadly tragedies. Anyone whose loved one died at a railroad crossing should be aware that there are strict state and federal rules regarding the duties of the railroad that operates those tracks. Sometimes the railroad fails, and they should be held legally accountable. After an Amtrak train derailed last May in Philadelphia, which killed eight people and injured dozens, it appeared that the railroad industry’s efforts to delay the installation of safety technology on all passenger trains was at an end. However, under pressure from Warren Buffett’s BNSF Railway Company, the US Congress passed another law that delayed the implementation of positive train control safety measures for at least 36 months. This technology would automatically slow a train if it were going too fast, such as on a curve. Therefore, railroad companies can delay buying and installing safety equipment that likely could prevent accidents such as the derailment in Philadelphia. The argument by Buffett’s company and other railroad industry advocates was this: If the positive train control technology mandate was not delayed, railroads would purposely slow how they do business due to liability concerns. Their rationale was that if a railroad missed the deadline to install new safety equipment, that company would face serious liability issues because they would be operating outside of law. So, the railroads would then decline to carry both passengers and commodities. They also would not deliver products that are classified as hazardous materials, including ones that are important to US commerce, such as ammonia and chlorine needed for water treatment plants. BNSF spent almost $4 million to lobby Congress to slow down the safety equipment mandate. Our railroad accident law firm is hardly surprised that railroad companies have teamed up to delay the implementation of vital safety technology that would save lives. One of our lawyers, Randy Appleton, recently wrote about how money spent to upgrade railroad safety systems is tiny compared to what a major train crash costs. Appleton wrote that 20 year installation, testing and maintenance costs for positive train control could be as much as $24 billion. However, how much money does it cost when there is a major train derailment that kills and injures scores of people? How much emotional trauma, pain, disabilities, lost wages and loss of work is there when there is another crash? Our firm’s position is that rail companies should install positive train control as soon as possible to reduce the chances of future accidents. A man died in Huron Township OH on Nov. 24 after a train smashed into his car at a railroad crossing. The man was driving a 2008 Ford van on Rye Beach Rd. in Huron Township when he approached the railroad tracks south of SR 2. He tried to skirt the railroad crossing gates when a Norfolk Southern train slammed into it. The train pushed the vehicle 1/2 mile down the tracks before it could stop. The man died at the scene. Police said that it appeared that the crossing gates were working, but the crash is still being investigated. All too many deadly accidents occur at railroad crossings across our country. If you or a loved one has been injured or killed at a railroad crossing, it is vital to have as much information as possible. For instance, did you know that there are many strict federal regulations that apply affecting the responsibilities of train crews and railroad companies? These duties include providing adequate warnings that train crews must sound at railroad crossings at proper intervals. Federal regulations also set maximum speeds for specific sections of track. Regulations also dictate when a horn and/or whistle must be sounded at crossings. There also are strict regulations regarding the maintenance of proper sight lines at railroad crossings; shrubs and vegetation must be cut so that drivers can see oncoming trains. Our Virginia railroad accident attorneys possess an excellent knowledge of pertinent state and federal laws that are in play in rail crossing accidents. We also contract with retired railroad workers who often investigate the circumstances and accident scene at specific crash sites. Such diligence in our investigations has led to sizable settlements in some railroad crossing accidents. In some of these incidents, we were able to prove that adequate warnings were not provided by the train crew. Railroad crossing accidents are often complex, and it takes a highly experienced team of personal injury lawyers and railroad experts to ensure that all regulations were followed by the crew and railroad company. When they are not, sizable legal settlements can and do happen, which can help a seriously injured person recover from devastating injuries. Work is currently underway at a deadly railroad crossing in Harriman, Tennessee that was the site of a deadly crash that killed two people in 2014. In May 2014, a car was struck by a train at the crossing of US 27 and Mountain View Rd. in Harriman. Several safety improvements were announced early this year, which were funded by a federal grant. Now at the crossing there are new warning signs, wider pavement and striping further back from the railroad tracks to warn drivers of the danger. A Roane County supervisor stated that there are two more signs that will be added, as well. The changes were entirely due to the 100% federally funded grant. The changes made were based upon a study done by the Tennessee Department of Transportation and the railroad. Engineers studies the number of trains and cars that pass through there, the chances of a crash, speed and visibility for drivers. Our railroad accident legal team has worked on cases with serious personal injuries and deaths that have occurred at public railroad crossings throughout the US. If this ever happens to you, it is important to know about the different federal regulations that affect the duties and responsibilities of the railroad crew that is running the train. These duties include respecting the warnings that trains have to issue when they are coming close to a crossing. For example, railroads usually set a maximum speed for trains, and federal regulations do as well. Federal regulations also specify when the horn and whistle have to be blasted at a railroad crossing. Also, regarding trees, shrubs and vegetation, there are federal rules on that as well. They specify the details about sight lines that should be available to drivers at railroad crossings. We have represented motorists who have been injured in railroad accidents, and know it takes a great deal of experience to know if it would be advisable to file a personal injury claim in such an accident. We also have worked on derailments that caused injuries to railroad workers. In some railroad crossing accidents or deaths, when there are no “active” warnings such as lights or gates, there a wide spectrum of safety issues that must be evaluated. In many tragic railroad crossing deaths, there is no evidence whatsoever that a driver was trying to “beat the train,” contrary to the argument that railroads often advance. Only a careful analysis of the safety of the crossing can answer these liability questions, and it requires objective expert analysis, and this analysis should be done as soon as possible to try to replicate the sight lines that both the train crew and motorist had. In many crossing cases, the railroads rush to alter the scene with slight modifications, and this can include cutting back foliage/vegetation among other subtle changes. If you or a family member suffers a railroad crossing crash, consult with one of our experienced railroad attorneys as soon as possible to assure that the evidence is preserved. It was 20 years ago on Oct. 25 that a horrifying collision between a Chicago commuter train and a school bus in Fox River Grove IL at a railroad crossing led to the deaths of seven students. Since then, there have been a number of safety improvements at railroad crossings across the US, but accidents can and still do occur. Some of the changes at railroad crossings include more traffic signals at crossings, better connections between traffic signals and warnings on trains. Also, there are more signs and markings on pavement to warn drivers and pedestrians to get off the tracks quickly. It was at 7 am on Oct. 25, 1995 when a Metra train out of Chicago, which was operated by Union Pacific Railroad, smashed into the rear of a school bus at a grade crossing at Algonquin Road in Fox Grove IL. The bus had crossed the tracks and was stopped for a traffic signal at a road right next to the road. The crossing gate came down on the bus and the engineer on the train blew the whistle, but the bus driver claimed she never heard these warnings. The end of the bus was approximately three feet over the tracks when the train smashed into it. In a report a year later, the National Transportation Safety Board had criticism for how buses were being routed and the general oversight of the bus drivers. The NTSB also said that the intersection design was improper, and the warning and traffic signal interaction also led to the crash. The NTSB further recommended more rigorous grade crossing inspections and guidelines so drivers better know if their vehicle is in the path of a train. Since the crash, there have been no more such incidents in IL, but there have been situations where buses were stuck on tracks because the crossing gates came down improperly. Our railroad accident attorneys are glad that there have been safety improvements on railroad crossings, but serious injuries and deaths still do occur. We settled a train crossing accident case in Prince William County VA when a freight train hit the rear of a car with two small children inside. Neither child was killed but both suffered head and other injuries. The driver of the car claimed that he could not see the train until the last second. We eventually demanded a settlement for our client – the mother – from the driver and Norfolk Southern, for $133,000.